What is a safe way of testing the reverse mechanism of my garage door? Testing the reverse mechanism is a good way to ensure that the emergency feature of your garage door still works. Our experts in Nutley suggest placing a solid object, preferably something that isn’t valuable, on the path of a moving garage door. If it does not reverse, then you should have your garage door opener checked. How do I lubricate my garage door? Lubricants come in different types and packaging. There are those that come in bottles or cans of spray. When looking for a lubricant, make sure that it is made for lubricating metal parts like those on your garage door. Other lubricants are made for other specific things and may not be suitable for garage doors. What maintenance routine does my door need? To keep your door working at its best, get it regularly checked by an expert. Let the tracks, springs, rollers, cables be examined by our professional garage door repair Nutley technicians at least twice a year. Never try to fix the door yourself because it is a risky thing to do. How much horse power is necessary for my garage door opener? The motor strength of the garage door opener you need depends on the size and weight of your garage door. 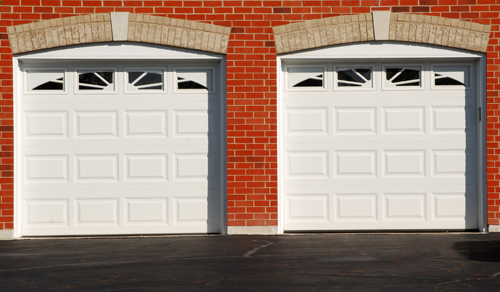 Our garage door experts say that a 1/3 HP motor is typically enough for 8x12 ft. doors. For bigger ones, ½ HP is recommended. The material of the garage door panel and frame should also be considered as heavier doors need stronger motors. Photosensors are, as the name implies, light-detecting sensors. According to our experts, two photosensors are positioned on the opposite sides of the frame of an overhead or roll-up door, usually near the bottom portion. These eyes have to “see” each other to allow door closing. Obstructions along the door path prevent them from seeing each other, thus preventing the door from closing.